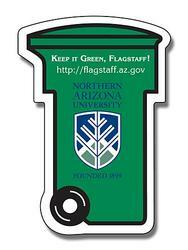 A 2.4375 x 3.5 trash can shaped full color magnet is outdoor safe and it can be sought by advertisers of all genres, who wish to seek an easy attention. This outdoor magnet is offered with 30 mil thickness, which makes it resistive against high winds. The UV coating of the magnet makes it heat and water repellent, thereby aiding in its long shelf life. Product Size: 2.4375 in. x 3.5 in.